Vizlib Calendar is a highly customisable, supported and easy-to-use control component for Qlik Sense which provides features as auto-detection of dates, date ranges, font and size control, interactivity, custom colours, pre-defined selections and lots of styling and formatting options. Vizlib Calendar is a control component extension and helps you handle and present date fields in a much more user-friendly way, allowing you to build intuitive and compelling dashboards for your users. The Vizlib Calendar supports one date dimension which needs to have the $timestamp metadata tag assign to it by the Qlik Sense data model. The Vizlib Calendar Wizard will support you in building the component, by providing you with a list of available date dimensions. The Vizlib Calendar does not support Measures, yet. This is a feature expected to be introduced in the near future. Choose between advanced and basic settings mode. The advanced mode will allow you to see all available settings whereas the basic mode only displays a subset of those, for a more user-friendly configuration. This setting allows you to choose between a single date picker (one calendar allowing you to pick single dates) or a date range picker (permitting you to select ranges of dates). Either collapse the calendar object to only display when the user clicks on the input box (saves real estate) or show the calendar expanded in full view. If no selections are made in the date field, the placeholder text will be displayed in the input box. Show/Hide the calendar label. You can modify the label name, the position, font size, colour and style. Show/hide the border of the input box including border width, color and radius. Conditional show for the reference line to display it only when the calculation condition is true. The date settings section in the property panel covers how the date field will be formatted and presented. Set the min and maximum allowable dates to be used in the calendar. By default, in auto-mode, the min-max available date values are used. Date re-presentation in the input box. By default, the default formatting of the date or the app locale is taken. However, you can change the appearance by selecting a different date format or even write your own custom one. For most users, the week starts on a Monday, however e.g. in Israel, the week begins on a Sunday. This option allows you to switch between the two. 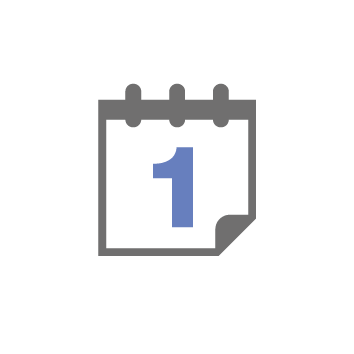 This will only display business days in the calendar object. Normally, when the date range picker is selected, the two adjacent calendar months are consecutive. By unlocking the calendar view, both months become entirely independent. This setting allows you to show & hide the weekday titles of the days in the calendar. Further to that, there are several styling and formatting settings available to modify the look and feel of the weekday names. By default, this setting reads your app's locale, however you can overwrite it by defining your own language in there. The calendar local sets the language how year, month and day names are called. Vizlib Calendar supports the use of holidays by formatting those days differently. You can either use the pre-defined set of holidays or add a custom sets of dates yourself. These days will then be formatted differently (background & text color). Date Ranges are relevant to the date range picker mode. The pre-define a set of days that can be selected as a shortcut. By default five date ranges are pre-defined. Gives your custom date range a name. Sets the direction of the days selection. The combination of the above settings will create a date range selection area which will be illustrated in a Preview. Here you can modify the appearance and show or hide different parts of the calendar. Show/Hide additional input boxes when the calendar is expanded to present the selected dates. Show/hides the border on the calendar body. You can also set the border width, color and radius. Show or hide the control panel and if displayed, position it either on the left hand or right-hand side. The control panel includes pre-defined date ranges. This section covers how the cell (calendar days) background is formatted in the calendar body. 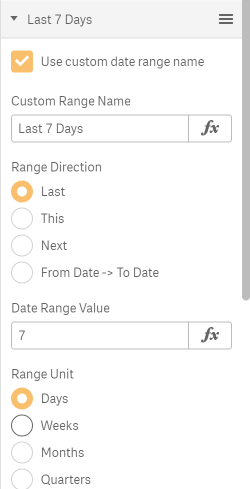 You can choose between standards Qlik styling, which uses its proprietary grey/white/green logic to indicated excluded, possible and selected days. Alternatively, you can also format the calendar yourself bespoke. Change Qlik's selected "green" to a different color. Background color a date cell assumes when you hover over it with the mouse. Background color a today's date cell. Same as with the background colour, this section covers how the cell (calendar days) text colour is formatted in the calendar body. You can choose between standards Qlik styling, which uses its proprietary grey/white/green logic to indicated excluded, possible and selected days. Alternatively, you can also format the calendar yourself bespoke. Text color a today's date cell. This section allows you to set a border around the dates, and define the width, colour and rounding of them. This section allows you to change the styling of the date range selector buttons (background, font color, border size and border radius). This section covers the cell sizes and as such the size of the whole calendar body. Defines how much space should be left between the individual dates. This option sets whether the size of the calendar should be picked automatically based on the size of the extension. Alternatively, also set a fixed calendar size. Define the radius of the cells and make it look like a circle. Permits the user to make date selections via the calendar object. Deactivating this setting will make the calendar read-only. Quick-Select allows the user to make a selection which is passed on to the data model immediately. No confirmation of selections is required. When enabled, dialog in collapsed mode is not closed after apply new selection. Dialog can be closed only by clicking outside of it. Set either a fixed date or a date range to be applied by default when the user enters the sheet. This setting is experimental and should only contain dates which are available and selectable in the chosen date field. This option is only available for the single date picker. It ensures the user can only select one date at a time. If more than one date is selected, the calendar enforces a selection of the latest date. Hide or show Qlik's native full-screen icon. Hide or show Qlik's native snapshot icon. Removed some extra margin at the top that was making the object not look aligned with other components. Formatting was incorrect for date range selections. Calendar was applying dates but not ranges. 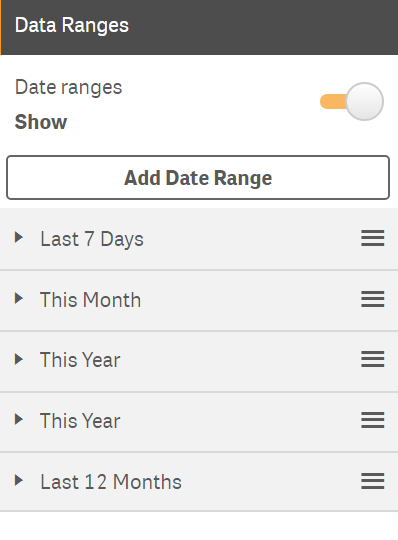 Date ranges input boxes were not updated after click when the calendar was in range mode. Added new custom date range selector 'From Date -> To Date'. 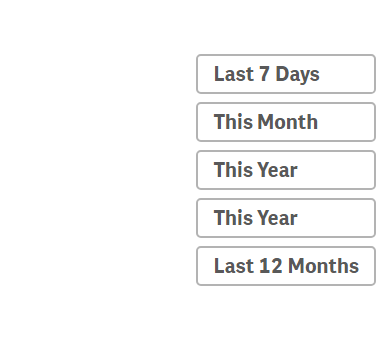 Added custom styling (background, font-color, border radius&thickness) for date range selectors. Added a 'Persist Dialog' option for collapsed mode in order to keep the calendar open after applying a selection. On a QSense mashup the Calendar was adding some undesired empty space at the bottom of the page. Calendar was not expanding on QSense June'17 and Feb'18. In some situations and on a mashup only, the calendar was adding a horizontal/vertical scrollbar. Fixed popup overlaps involving the OK/Cancel selection buttons. Fixed extension overlap with other components in edit mode. Fixed issue where Vizlib Calendar would produce unexpected results when used with more than 5,000 dates.